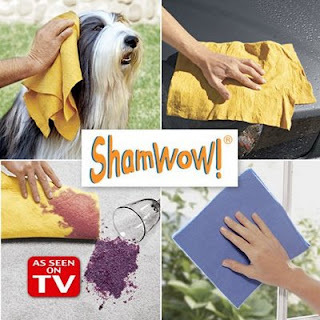 Recently I started seeing this Infomercial for a product called ShamWow. It is by far my favorite Infomercial of all time now. The guy is just crazy, and the product is just WOW! ShamWow is this cloth that holds a ton of water and is supposedly better then any other towel you can get. It's made in Germany and you know the Germans make great stuff. Then of course you know Olympic Divers use it (Wait... WHAT?!) The product practically sells itself! Check out the Infomercial and the Parody below it. What is your favorite Infomercial? If you have a youtube link go ahead, link it up! Dude! I just saw him tonight in a commercial for "Slap-Chop"! !